Welcome to The Autograph Binder. My name is Geoff and I'm the site editor. I collect autographs from both celebrities and sports personalitites. Feel free to look around. I'm still working on the site but most of the pages and up and running. If you have any questions/coments/suggestions/addresses please Contact Me below. Sorry there haven't been updates in a long time but I've been on vacation and busy with stuff. 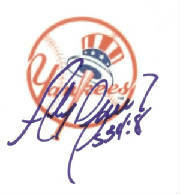 I've added a bunch of scans to the TTM Scans page which is now up to 50. I still have more work to do. I didn't update the TTM Autographs or In-Person Autographs pages yet but the counter right above this is accurate. Recently I've recieved David Letterman and Larry Bigbie both of which are on the TTM Scans page. © 2005-2006 The Autograph Binder. All Rights Reserved.